View cart “Vanyanís Gold Corset Jewellery Set” has been added to your cart. No sophisticated wardrobe can be truly complete without an elegant yet daring little black dress! If you’ve struggled to find a pencil dress to fit your curves, then this is your answer. Our versatile, must-have Ebonique pencil dress is designed to accentuate all your curves to breathtaking effect. This delightfully figure hugging dress is made from a high quality ponte; a sumptuously firming yet oh-so-soft stretch fabric. The sweetheart neckline features a gorgeous Leavers Lace panel, carefully cut to accentuate your bust. Our aim in designing this stunning little black dress was to create a stand out garment that will make you feel as glamorous and confident as possible – and make all around you turn their heads! For your chance to be featured, use #EboniquePencilDressLace on Instagram. For the best fit, please check your measurements against the sizing chart above. For help and instructions on how to take your measurements, click here. This dress is very curvy, with a fitted waist. It is designed to fit a natural hourglass figure. If you’ve found that pencil dresses usually are too big in the waist and too small in the bust (with too much of the dress proportioned to fit your back), then this may be the answer! The ponte fabric is tightly woven with some stretch built in, resulting in a firm-feel fit, with some sizing flexibility. For best results dry clean or hand wash in cold water. Or, gentle machine wash in a garment bag in cold water. Wash separately. Use mild detergent. Dry flat in shade. Do not bleach. Do not tumble dry. Do not wring. Warm iron inside out. At Vanyanís, we believe in slow fashion – high quality, versatile pieces made to last – not fast fads to be discarded in a few months. Rather than a passing trend, we focus on fashion as an investment; a Vanyanís wardrobe is a collection of timeless favourites made with quality and ethics at the fore, because we pride ourselves on paying a living wage. Designed in the Yarra Valley, Australia. For more information about our ethical manufacturing process, click here. At Vanyanís, we believe that elegance goes hand in hand with comfort and utility. This is why our decadent satin skirt has two generously deep hidden pockets - freeing you of the need for a clutch should you choose. The skirt is cleverly cut to accentuate your waist and hips, without adding 'bulk' at the front. The luxurious satin is gathered at the back and sides, joining the flat front. The hemline is generous and you instantly want to swish about when you wear it. Why not wear a petticoat underneath for a vintage feel? This skirt is the height of luxury and we've loved bringing a couture feel to this garment. The skirt is fully lined in cupro (a hypoallergenic, anti-static fabric made from the silky fibres of the cotton plant) which feels incredibly soft against your skin. Christian Dior once said "You can wear black at any time. You can wear it at any age. You may wear it for almost any occasion." We couldn't agree more. No sophisticated wardrobe can be truly complete without an elegant yet daring little black dress! If you've struggled to find a pencil dress to fit your curves, then this is your answer. Our versatile, must-have Ebonique pencil dress is designed to accentuate all your curves to breathtaking effect. This delightfully figure hugging dress is made from a high quality ponte; a sumptuously firming yet oh-so-soft stretch fabric. The sweetheart neckline features a sheer Italian mesh. These Sweetheart Tops are made with a luxurious bamboo jersey and Italian sheer mesh, bringing glamour to your daily wardrobe. We believe fashion should be versatile and we love how wearable these tops are. We've tested the fit of these tops on women with all different bust sizes and it consistently flatters, giving an amazing fit for a range of shapes. This is no ordinary 'tee'. Key to the success of this versatile fit are a number of hidden elements, including: • Clever patterning drafted to fit and accentuate your own shape (rather than relying on the stretch of the fabric) • Designed to accommodate larger busts (so that armholes will not stretch to expose your bra) • A centre back seam (allows the top to follow the natural curve of your back) • A curved hemline that comes up into small split at the side seams (to give shape and accommodate hips) • A longer back to allow elegant, flattering styling over pants and leggings • To ensure the long life of this garment, you must wash it in a garment bag, in cold water on gentle cycle. See ‘Fabric & Care’ tab below for all care instructions. As part of the slow fashion movement, we believe clothing should be sewn to last and we've taken extra care to ensure that the seams of this garment stay strong. Bamboo is an eco-friendly, hypoallergenic and breathable fabric. We spent months sourcing these particular fabrics to ensure the garment could be worn frequently – and with its endless styling potential we're confident you'll love it like we do! Please note: These earrings are currently being made by our jeweller. Orders will ship on Tuesday 4th of September. Back orders will ship on Monday 24th of September. Introductory price of $249 (RRP$275) ends 4-Sep-18. For corset lovers everywhere! With these delightful earrings you can wear part of a corset every day. They’re your very own little tokens to symbolize your love of corsets that you can wear anytime, in any occasion whether to work or a special event. The unique earrings are made with two of our original Gold Engraved Corset Busk loops, that have been handcrafted in Melbourne and transformed into elegant earrings. The gold plated loops have been expertly engraved with a two-tone antique black laurel design (reminiscent of Victorian corset details) and then transformed into earrings by our favourite jeweller in the Yarra Valley. The earring hooks are made with solid 9ct gold and have a lovely swooping shape and are of a sturdy weight, balancing out the design with the engraved loops. The gold earrings are beautifully presented in a black jewellery box, making it the perfect gift for yourself or a loved one. Make every day a luxury, with Vanyanís Gold Corset Earrings. Please note: This set is currently being made by our jeweller. Orders will ship on Tuesday 4th of September. Back orders will ship on Monday 24th of September. Introductory price of $309 (RRP$390) ends 4-Sep-18. Our long awaited Gold Corset Jewellery is now available! We put this set together for those that desire the ultimate package for our corset themed jewellery. With the delightful gold pendant and earrings you can wear part of a corset every day. The complete set is your very own token to symbolize your love of corsets that you can wear anytime, whether to work or a special event. Because they are so sleek and understated, they are suitable for any occasion. The unique pendants are made with our exclusive Gold Engraved Corset Busk loops, that have been handcrafted in Melbourne and transformed into the elegant jewellery you see here. 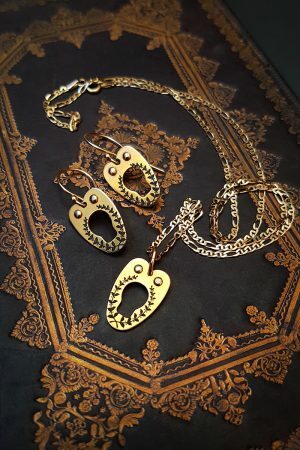 The gold plated loops have been expertly engraved with a two-tone antique black laurel design (reminiscent of Victorian corset details) and then transformed into a pendant (complete with solid gold jump loop) and earrings (with 9ct solid gold hooks) by a talented jeweller in the Yarra Valley. Whether you wear them as a whole set, or style them with jewellery you already have – the choice is yours with these unique, handmade pieces of luxury. The pendant looks lovely styled with a length of black ribbon, or worn with a delicate gold chain. (Please note the chain is not included). This set is beautifully presented in a black jewellery box, making it the perfect gift for yourself or a loved one. Make every day a luxury, with Vanyanis Corset Jewellery. "I love how it must look quite mysterious to a non-corset wearer: it's obviously a very deliberate, even utilitarian shape - but what of?! I can't wait to be asked about it." - Emmelie Please note: This set includes one necklace pendant and a set of earrings. The chain is not included. (The RRP for both items sold separately is $390AUD). For corset lovers everywhere! With this delightful necklace you can wear part of a corset every day. It's your very own little token to symbolise your love of corsets that you can wear anytime, in any occasion whether to work or a special event. This unique necklace features one of our original Engraved Corset Busk loops, that has been handcrafted in Melbourne and transformed into an elegant pendant. The loop has been expertly engraved with a two-tone antique black laurel design (reminiscent of Victorian corset details) and then transformed into a pendant (complete with silver loop) by a talented jeweller in the Yarra Valley. The pendant hangs on a delicate 'Figaro' sterling silver chain that adds detail, without detracting from the pendant. Our customer Emmelie said (on receiving her necklace) "I love how it must look quite mysterious to a non-corset wearer: it's obviously a very deliberate, even utilitarian shape - but what of?! I can't wait to be asked about it." It is beautifully presented in a black jewellery box, making it the perfect gift for yourself or a loved one. Make every day a luxury, with a Vanyanís Corset Necklace. Book your place in this Advanced Corsetry Class and learn how to make your own steel-boned genuine overbust corset. The focus of this class is to learn how to work with 'fashion fabrics' as well as a more in-depth look at refining corset fit (especially over the bust area). At the end of this corsetry course you'll have a custom fitted corset (made with the fashion fabric of your choice) and personalised pattern to keep. You'll gain the confidence, knowledge and inspiration to build on your success and make more corsets in different fabrics on your own. Receive expert guidance from an industry professional in a fun, warm environment. All shapes, sizes and ages welcome! For accommodation and travel advice, please contact us directly. Experience: you must already have experience making corsets and have previously attended at least one other Vanyanís corsetry course. Prior to class you will need to complete some pre-course work. You will be sent a kit with fabric and instructions to sew a corset toile which you will need to bring to class. Book your place in this Corset Pattern Drafting Class and learn how to draft your own overbust corset pattern, completely from scratch! You'll learn what measurements to take for accurate corsetry, and then using those measurements draft a pattern. You'll make a toile to test your pattern and learn about corset fit and how and where to apply changes to your toile. After the fitting, you'll learn how to accurately transfer those changes to your pattern. The focus of this class is to learn how to create your own corset patterns from measurements, and fit them beautifully. At the end of this pattern drafting course you'll have a personalised overbust corset pattern to keep and the knowledge of how to do it independently. You'll gain the confidence, knowledge and inspiration to build on your success and make more patterns in different styles on your own. Receive expert guidance from an industry professional in a fun, warm environment. All shapes, sizes and ages welcome! For accommodation and travel advice, please click here. Experience: you must already have experience making corsets and have previously attended at least one other Vanyanís corsetry course. The exception to this is if you have quite a bit of experience with working with patterns and pattern drafting. Depending on the pace at which you work, there may be a small amount of "homework". Book your place in this Advanced Corsetry Class and learn how to make your own steel-boned genuine underbust corset. The focus of this class is to learn how to work with 'fashion fabrics' as well as a more in-depth look at refining corset fit. At the end of this corsetry course you'll have a custom fitted corset (made with the fashion fabric of your choice) and personalised pattern to keep. You'll gain the confidence, knowledge and inspiration to build on your success and make more corsets in different fabrics on your own. Receive expert guidance from an industry professional in a fun, warm environment. All shapes, sizes and ages welcome! Book your place in this Beginner's Corsetry Class and learn how to make your own steel-boned genuine underbust corsets. At the end of this corsetry course you'll have a custom fitted black corset and personalised pattern to keep. You'll gain the confidence, knowledge and inspiration to build on your success and make more corsets on your own. Receive expert guidance from an industry professional in a fun, warm environment. All shapes, sizes and ages welcome! IMPORTANT: For all course details, student requirements and skill level, a list of what to bring and what to wear, please click here. This, we firmly believe, is the tote to end all totes! Luscious, robust, and embroidered with our gorgeous gold corset monogram, this black bag truly marries elegance and beauty to strength and durability. Made from a hard-wearing black satin fused to cotton and lined in a soft satin, this bag is super-strong and sewn with small stitches. It truly is made to last. We cannot wait to hear how you will use your very own Vanyanís Luxury Tote! Our busks are made in Germany and then engraved by hand in Melbourne (Australia)! Inspired by the antique corsets of the Victorian era, these original Engraved Busks are created by Vanyanís and are the first of their kind in about 100 years! These high quality German 'silver' stainless busks have been carefully engraved with a delicate antique black laurel leaf design on each loop of the busk. The Antique Black engraving is a lovely fusion of old and new. From some angles the engraved laurel can appear gold and in direct light it appears black. It really does depend on the light and this lovely two-toned effect gives the busk a gorgeous antique feel. Using the very best of modern technology the pretty laurels come up crisp and clear on each loop and do not rub off or wear away. They are the perfect finishing touch for your special corset, whether you're recreating an antique design or just love luxurious little details in your corsetry. Engraved Busks are not made anywhere else in the world - they are unique to Vanyanís and now available to you! We can't possibly make corsets for everyone so have made these available to everyone so that anyone can enjoy these very special busks. For more information about our busks check out the 'tabs' below. At Vanyanís, we believe in slow fashion – high quality, versatile pieces made to last – not fast fads to be discarded in a few months. Rather than a passing trend, we focus on fashion as an investment; a Vanyanís wardrobe is a collection of timeless favourites made with quality and ethics at the fore. Vanyanís is a luxury fashion label known for sophisticated, sumptuous designs. We specialise in Exquisite Corsetry, Bridal Couture and luxurious Ready-to-Wear collections. We are based in Yarra Glen (east of Melbourne, Australia) and see clients by appointment only. ©2019 Vanyanis · Made with by VT.